In October 2016, Sheikh Ghassan Manasra, Dr Anna Less and David Less made presentations across London (including for students of Kings College, London) and at Birmingham, Oxford and Cambridge Universities. They spoke to over four hundred pupils at the prestigious the Camden School For Girls’ sixth formers, hosted two interfaith Sukkot events (one with old friend of the AR, Rabbi Mordechai Zeller, recently moved to the UK), and held a beautiful interfaith evening at St Ethelburga’s Centre For Peace & Reconciliation. 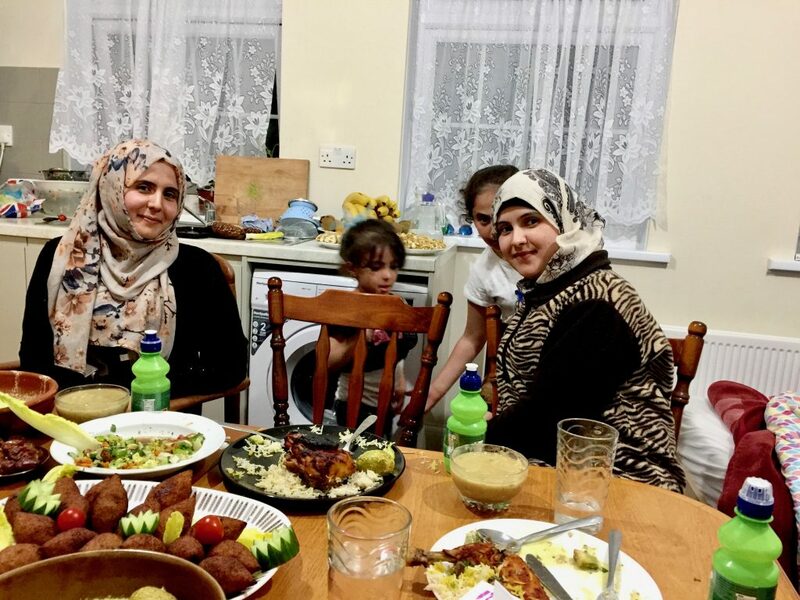 Last night we were invited to Alaa’s home for an Iftar dinner. Alaa and his family are Syrian refugees from Aleppo that we met at Rabbi Wittenberg’s party. Before we leave for Alaa’s home we go to the Syrian market around the corner and Ghassan helps me pick out the special sweets that are made for Ramadan and we prepare a gift to bring. We call an Uber and take off for the Finchley district of London. Along the way we see traditionally dressed Jewish families walking to shul for Shavuot services. Shavuot is a major Jewish holiday celebrated fifty days after the second day of Passover for two reasons. 1. It marks the all-important wheat harvest in the Land of Israel and 2. It commemorates the anniversary of the day God gave the Torah to the entire nation of Israel assembled at Mount Sinai. In other words Shavout for the Jews correlates to Ramadan for the Muslims. It is interesting to me that the British government has chosen this neighbourhood as a place to settle Syrian refugees. I make a mental note to ask Alaa about this later in the evening. After some driving around the Uber driver drops us in front of a vacant storefront in the middle of a shopping district and tells us this is the address. We look around and see lights in apartment above and call Alaa on the phone. He pokes his head out the window, grins and waves and points around the corner. He meets us in an alleyway behind the empty store and we climb the stairs to a tiny apartment. We enter a small entry hall where men’s, women’s and children’s shoes are neatly assembled along the wall. As soon as we pass the shoes we turn left into a very small living room jammed with 3 obviously used and mismatched loveseat sofa’s lining 3 of the walls. A large flat-screened TV is playing on the 4rth wall and 2 small mismatched end tables fill the center of the room. There is nothing on the cleanly painted walls and a curtain hangs in the window. Alaa, Ghassan and I each sit on separate loveseats and begin to talk. Alaa’s 4 year-old niece Julia comes in to introduce herself and Alaa’s 8 year-old daughter carries in her 2 year-old cousin. She introduces herself and her cousin in a perfect British accent and uses the remote to turn down the sound on the TV, which continues to play in the background. The aroma of delicious smelling food fills the apartment. It is almost 9:00 and I am acutely aware that no one in the apartment has eaten or drunk anything since about 2:30 AM. We chat for a while and I ask Alaa why has the British government settled them in a Jewish neighborhood and he replies, because the Jewish people petitioned for us to be here. They invited us…. “It has been the Jewish community that has helped us 100% since we have come to England,” he says. No other community has really done much. It’s the Jewish community that has supported us. After about twenty minutes the Muslim call to prayer blasts out. At first I wonder is there a mosque nearby? But then quickly realize the sound is coming from Alaa’s phone. It is time to break the fast. We walk down the hallway past a bathroom and 1 bedroom to the only other room in the house, a kitchen. As soon as we walk into the kitchen there is a table laden with a huge feast. The table fills the entire room and I worry, have they spent their entire week’s food allowance on this one meal? Two very quiet and young women are laying out the last dishes and pouring drinks for everyone. Every one washes their hands and we squeeze around the table Alaa, Ghassan and I are on one side and Hashim’s wife sits on the other side with the other woman who gathers Alaa’s niece and nephew onto her lap. Alaa’s daughter sits at the end of the table. The adults are studying their cell phone’s intently counting the seconds until they can take a sip of juice. The younger children are already sucking on sippy cups. Finally the moment comes and the call to prayer blasts out again and each person reaches for their waiting glass of juice and nearly finishes it in a few gulps. They smile and begin serving food. My plate is so full it is spilling over. There are kibbeh, kebabs, and stuffed zucchinis, dates, salad and roast chickens over rice with raisins and nuts. It is the best Syrian food I have ever tasted, but people eat quickly. Hunger overcoming the need to savor the food. I remember to take a picture of the food before it is entirely gone. Once people’s hunger has been satisfied we settle down to talk and eat more slowly. Blog Where is Alaa’s brother? I look at the two women in hijabs and long robes sitting opposite me who have prepared this meal. They have barely spoken and look nearly identical. I wonder are they twins? It is not polite in Arab culture to ask a man to introduce his wife by name so I still do not know how to address them. But slowly, quietly and hesitatingly the women begin to join the conversation. A’aa explains they are sisters. And Alaa’s wife says she is thirty-one. Her sister introduces herself as twenty-six. She cradles her small son who looks about one and half, but is nearly three. He wears thick glasses and barely speaks and sits very quietly in her lap. She explains that she is alone here with her children because her husband has not been able to “get out” yet. She says that although her daughter goes to a nursery, her son does not want her to leave him, so it is difficult for her to go to school to learn English. 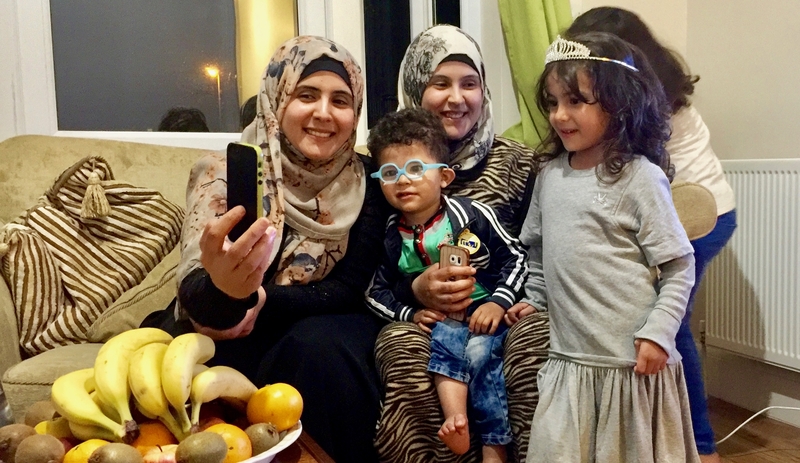 She lives about 25 minutes away by bus from Alaa’s family, so can only see them once every week or two, because here she is a single parent with the full responsibility for her two children and her household. Alaa explains that the Jewish synagogue has a women’s program every other week so the Syrian women and the Jewish women in the synagogue can meet. He says this is a lifeline for the refugee women who have traditionally depended on relatives for companionship. 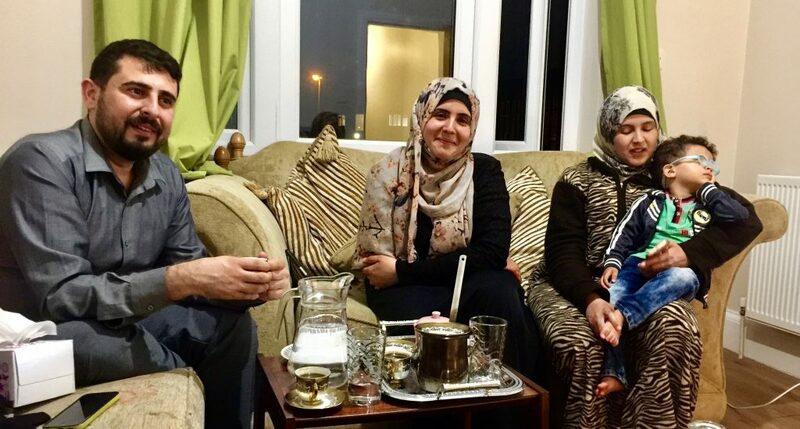 He says that Syrian women do not have the skills to make friends with women outside of their families, so in England they can be very isolated and depressed. I look at this young 26 year old mother and tell her she is strong and doing great job and she smiles. Alaa goes on to explain she is married to his brother. When we left Syria the only thing I took with me were my papers. We went to Lebanon, but they only let us stay for one day so we went to Jordon, We were in the camps for two days. Then I found a small apartment and we lived together, my family, and my brother’s family. 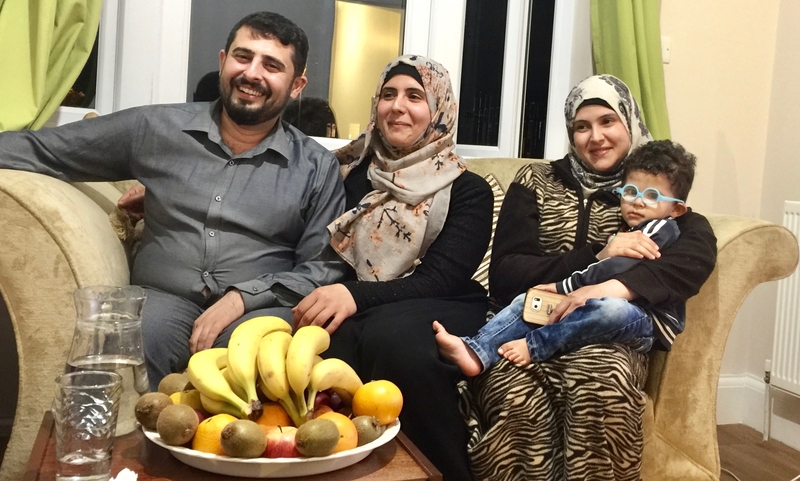 Because I was a pharmacist they let me work and I could find a job working nights because the Jordanian pharmacists all wanted to be home with their families at night, and because I was a refugee, they could pay me very little. I could not support every one on what I was making. We had nothing but because my brother was a refugee he was forbidden from working. But he managed to find work under the table, but someone reported him, and they took away his papers, and told him if they caught him working again they would send him back to Syria. So he looked what to do, and he found an office where he could get permission papers to work in Dubai. 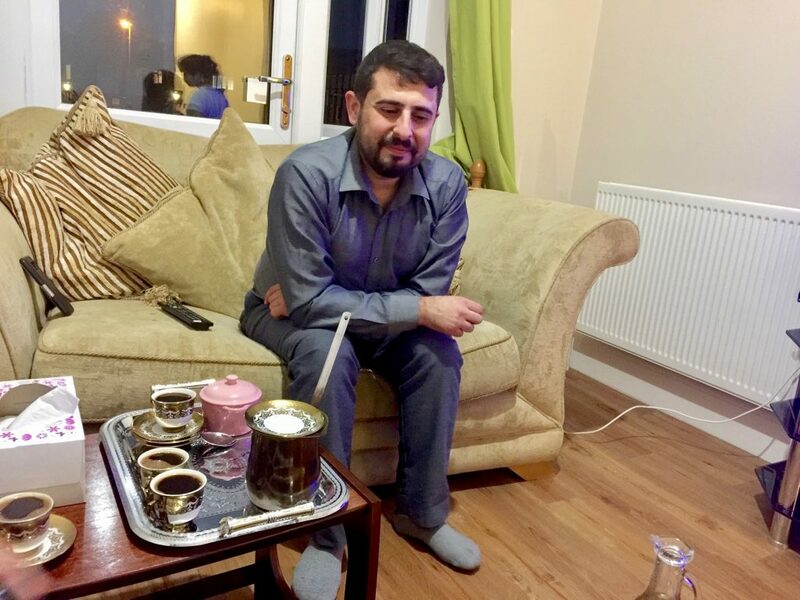 He paid for those papers and went to Dubai, but it turned out the papers were fakes, so because of this, he was not with us when we got permission to come to England. He was in Dubai. They told us that our best chance was for my sister-in-law to come with us and apply for him to come once she got settled here. We are still waiting. His sister-in-law says her 4-year-old daughter asks for her father all the time, but her son cannot remember him and never asks. She does not want to sleep in a room with windows, and this is the only place where she feels safe at night. As I continue to look around the room I ask Alaa how does this apartment compare to where he lived in Aleppo and he shakes his head and smiles and softly says, “There is no comparison.” He begins to count the rooms of his Syrian home on his fingers and concludes that they had a two-story home with over 12 rooms not including the bathrooms. Blog Is Alaa Surprised That the Jewish Community has Helped Them? Alaa’s refined mannerisms and perfect English clash with the shabby room and its large TV. It was easier to imagine him in an upper middle class suburban home suitable to a highly, educated successful professional. But he explains he still has many hurtles to overcome before he can work here. He has to live in England at least two years and he has to become relicensed as a pharmacist in England before he can work. He says he is taking college courses and he consistently graduates as number one in his class. He also does volunteer work as a translator, and as a teacher, but he longs to work and earn money. He says they have enough for basics, but nothing extra. Although he has lived here for six months, he has only visited other areas of London once because he worries about spending their meager income on transportation. He has not been able to afford to eat in a restaurant, nor been able to get a driver’s license (although in Syria he owned a car). When we lived in Syria life was very hard and they always told us that the reason conditions were bad was because Syria has to defend themselves against Israel. Conflict with Israel is the excuse that governments in the Middle East use to keep their own people oppressed. People know that the “problem with Israel” not entirely true, but still I was surprised. It is the Jewish community that has supported us one hundred percent. And without them I don’t know where we would be now. We continue to talk until almost mid-night. Alaa says he is so grateful to England for saving them and he is “disappointed” that the Gulf States have refused entry to the Syrian refugees. His family is scattered around the world now, they are in Africa, England, Sweden, the US and Jordon, and Syria. He says worriedly he has had no news of his parents and other family members left behind in Aleppo since he left over six months ago. We take pictures and promise to stay in touch.